With one foot in the past but with an eye very much on the future, Cartier presents the Ballon Bleu 33mm—the epitome of elegance and sophistication. A contemporary watch with classical style, the Ballon Bleu de Cartier watch at 33mm brings together advanced technology with traditional watchmaking techniques to present a timepiece of exquisite beauty and elaborate design that hangs effortlessly from female wrists. 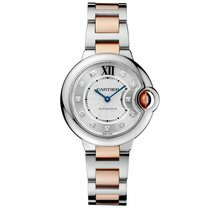 The contemporary nature of the Cartier Ballon Bleu 33mm is conferred through its name. Put simply, the “Ballon” of the Ballon Bleu points to the convex curves found within the watch’s casing. Tactile and pebble-like, the Ballon Bleu 33mm is shaped to suggest a lightness and effervescence not seen within other watches. The “Bleu” of the Cartier Ballon Bleu 33mm is so named after the sapphire cabochon winding mechanism that contains a luscious azure colored stone. This too is protected by an arc of metal to further add to the Ballon Bleu’s elegant design. When crafting the Cartier 33mm Ballon Bleu, each step of the process adheres to Cartier’s stringent standards. With more than 1000 highly skilled individuals working within the Cartier manufacture, experience and knowledge underpin the very core of Cartier’s engineering philosophy. From the initial design to the luxurious finishing touches of exquisite appeal, each and every Cartier Ballon Bleu 33mm is manufactured with an uncompromising attention to detail. Whilst the Cartier Ballon Bleu 33mm’s contemporary aesthetic is plain to see, each example within the collection owes much to Cartier’s horological legacy. Whether the unparalleled precision of an electronic quartz movement or the rhythmic intricacy of traditional mechanical movements, Cartier’s commitment to master craftsmanship is always present. In fact, with more than a century of high quality manufacture and design behind all Cartier watches, it’s a safe bet that the Cartier Ballon Bleu 33mm will continue to run well into the future.